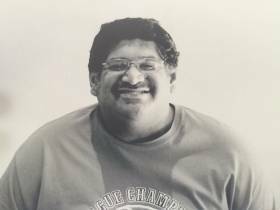 Rojelio “Roy” Beltran, age 47, of Holland, died Saturday May 2, 2015 from injuries sustained in an accident..
Roy had volunteered at Evergreen Commons in the past. He was preceded in death by his father Patricio Beltran in 2008. Surviving are mother Maria Beltran , sister Lisa Beltran , niece and nephew Courtney and Caleb Beltran. Also surviving are Aunts, Uncles and cousins. Funeral services will be Thursday at 10:00 am at St. Francis de Sales Catholic Church. Visitation will be Wednesday 6-8 pm at Mulder Chapel, Dykstra Funeral Homes Inc 188 West 32nd St. Memorial contributions may be made to Evergreen Commons or Michigan Special Olympics.